Colour without the commitment from St. Tropez One Night Only Wash Off Face & Body Lotion! 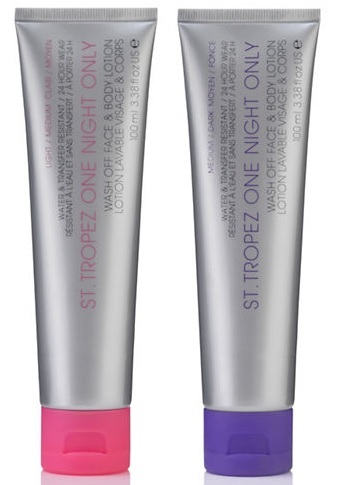 St. Tropez One Night Only Wash Off Face & Body Lotion - 100ml - $20 - in Light/Medium - for a classic golden glow and Medium/Dark - for the ultimate deep bronze - a no-commitment, easy-to-apply bronzing lotion for a radiant sunkissed glow that lasts up to 24 hours or easily washes off with soap and water if you want to be done with it sooner. Contains RAINMAC technology with silicon coated pigments that ensures colour won't streak or run even when wet and won't transfer onto clothes or sheets, but can still be easily removed with just soap and water. Skin is left smooth, hydrated, and perfectly luminous.